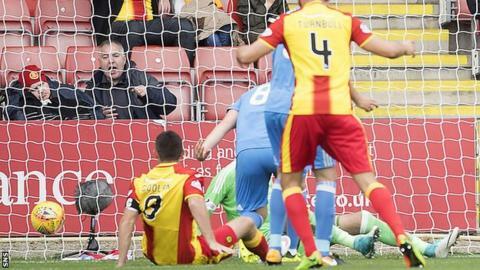 Partick Thistle striker Kris Doolan fulfilled a career goal as he found the net against Aberdeen but was left with mixed emotions after a 4-3 defeat. The 30-year-old had scored against 11 out of the 12 Scottish Premiership clubs before Saturday's strike. "That's every team in the league ticked off the list," he said. "On the one hand, I was delighted to get that goal against them. I was hoping that it would have meant something, so I'm disappointed." Doolan, who has added three more to his career tally this season, admitted that his lack of goals against the Dons had been a source of frustration. "It's been there for the last couple of years," he said. "It's always been in the back of my mind every time we play Aberdeen to get that monkey off the back. "It was annoying me a wee bit, so it was good to get that goal against them."